In March 2014 Northeast Creek Streamwatch participated in the Durham Creek Week stream clean-up by cleaning the banks of the creek that flows into the Parkwood lotus pond and lake. In preparation we had advertised in several local businesses. We set up a table with a banner announcing a creek clean-up, and people came out to participate. Among the folks who helped were several youth, one of whom rode by on his skateboard and went home to change and came back to work. Several of the youth belonged to a local youth group and asked if their youth group could do a another clean-up as they were looking for service projects..These youth were participants in a community leadership training program facilitated by Barry Archer of Barak Source for Learning; they came to the next monthly meeting of Northeast Creek Streamwatch and invited our group to meet with them. As a result of that meeting, Northeast Creek Streamwatch collaborated with Spring Break enrichment program by locating a speaker from the Ellerbe Creek Watershed Association, who spoke about urban creek runoff and the problems of erosion and non-point-source pollution. The group then conducted two days of clean-ups and learned about the hydrology, plants, and animals of a section of Northeast Creek that included blooming paw-paws and spring ephemerals. This section includes meanders and oxbow ponds, which are normal flood plain features in the geography of the Durham Triassic Basin. 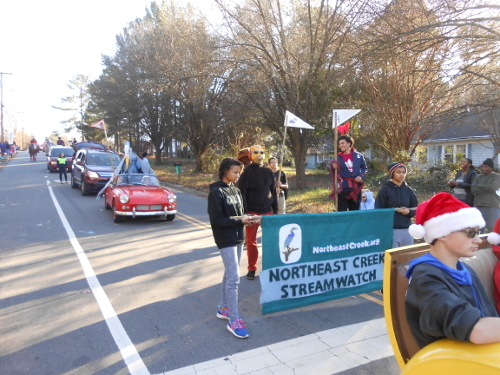 In December 2014, this youth group marched as part of the Northeast Creek Streamwatch unit in the Parkwood Christmas Parade, wearing costumes of a great blue heron, deer, and other creek critters. 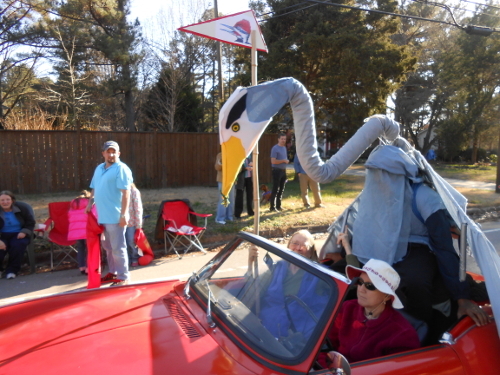 In January 2015, this youth group helped make costumes of other creek critters in preparation for the Durham Creek Week kickoff parade. 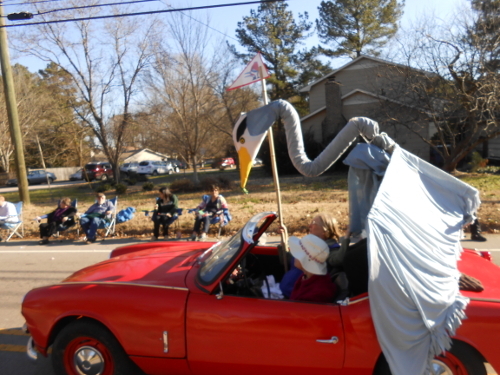 In March 2015, they marched as herons, frogs, and other creek critters in the parade. 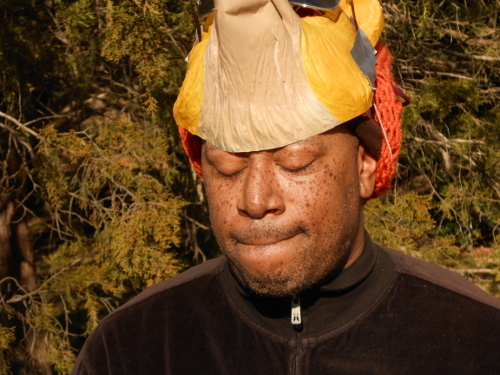 Adult facilitators and parents of the youth marched as a fox, a leaf and ladybug, an opposum, and a beaver. The leader of this group Mr. Barry Archer trains the youth in leadership skills, and we have been very impressed with the ability of the youth to volunteer and seek out opportunities for service on their own. Northeast Creek Streamwatch takes this occasion at the end of a summer program put together by Mr. Archer and Mr. John Apel to thank them for their continuing collaboration with the efforts of Northeast Creek Streamwatch and to the greater Parkwood community. We also thank the youth who have been involved in these several programs for their hard work in cleaning up Northeast Creek and their willingness to learn the science, technology, engineering, and math (STEM) skills involved in the creek and its care. 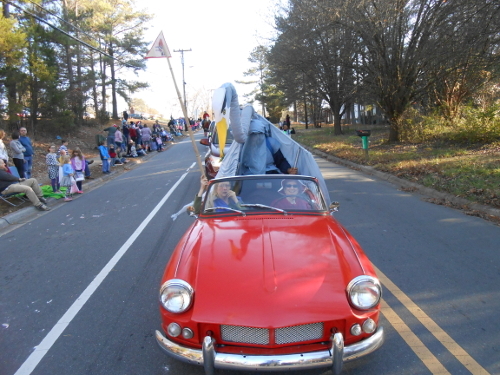 Northeast Creek Streamwatch put a unit in the Parkwood Christmas Parade again this year. Here are some pictures.